It’s been a while since I shared some old catalog images. 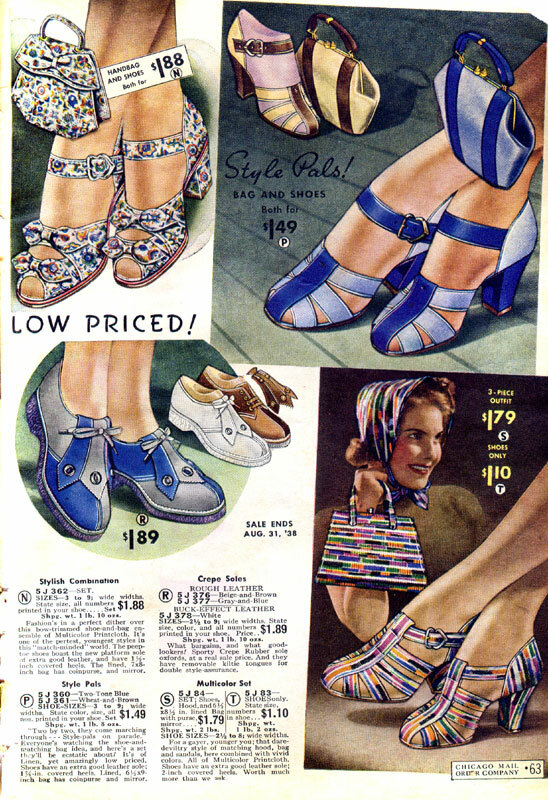 Finally got my scanner hooked up again, so I have two darling pages to show from a 1938 Chicago Mail Order catalog. This comes from a little sale catalog and it’s one I go back to over and over again for style inspiration. In fact, it’s in this catalog that I found the image I based my Fiesta Farmerettes off of! Paging American Duchess– I want “N” in the above photo- the floral ones with little bows on the front and open toes with matching purse, k? I’m not picky… I’ll take them in stripes instead of florals ;) Or green. « “Rita” Shorts- Official Pattern Preview with Pictures! I know it’s not super fashionable now, but I love socks with heels. Makes me think of Dorothy with her blue socks and ruby slippers. Can I have one of each, please? :D Although I particularly love N too, and R. Those have kind of a fun bowling shoe vibe that would be great with wide-legged trousers. If only! H, M, & P for me! 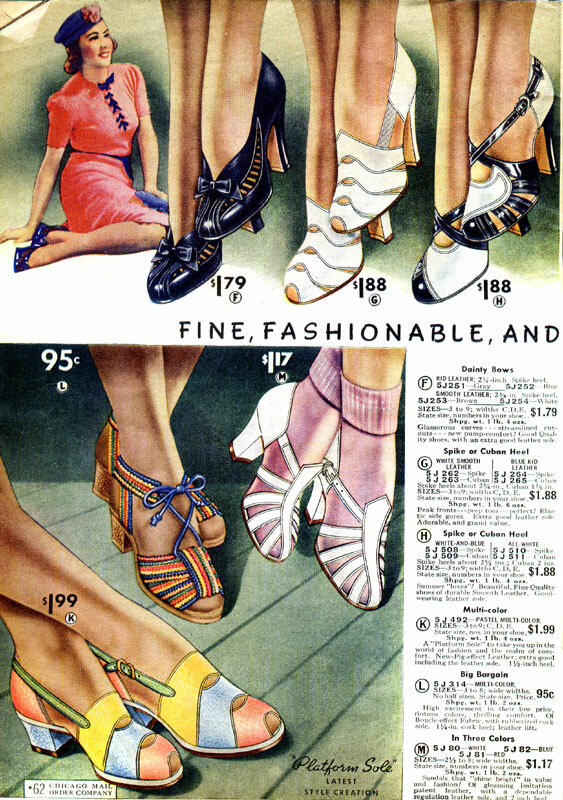 Oh my… I was born in the wrong era for shoes. I’ll happily trot down the street in these any day, especially H! So cute! I want them all! How wonderfully fun and upbeat! There isn’t a single pair I wouldn’t sport with a mile wide smile on my face, but am especially drawn to the darling double bow, floral print pair (with matching handbag to boot!). Wishing you a relaxing, gorgeous weekend! These are so pretty! I think my favorite is “L” in the first page scan. So cute and colorful! I want them all, but if American Duchess wants to do the blue stripes with matching handbag, I’m in!